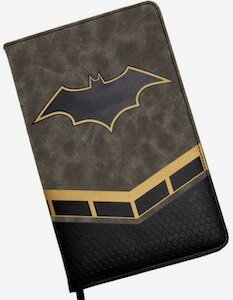 Now you can have this cool looking Batman Journal. The journal has a cool cover with a leather looking cover with the famous Batman logo and even the famous tool belt seems to part of the design. Inside the journal, you will find some card slots and a string bookmark and then there acid-free lined paper so that you have lots of writing space. Take this journal to school, work, or at home and it will always be ready for your notetaking. The Batman journal measures 5 1/2 x 8 1/2 inches making it the perfect size for easy use almost anywhere. Now there is a true Batman pencil case. 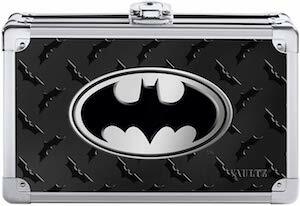 The pencil case is actually a real case complete with a lock and it looks really cool as it is black with chrome corners and on the black you can find many bats and a big Batman symbol in gray scale. Inside the pencil case there are some elastics and mesh pockets to organize your pens, pencil, and other things you use at your desk at school and the office. Now you can have a strong box in your backpack to use with your writing supplies but you could use this cool box for storing other things too. Now there is nice Batman harness style backpack. 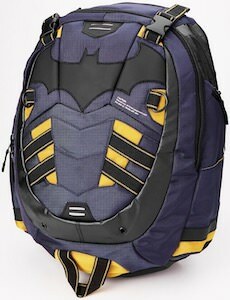 The Batman backpack is not a bag that screams Batman but it clearly is to fans of the Dark Knight like you. The backpack on the outside looks like of like a harness made with lots of dark colors like black, purple and then there is yellow to and the Batman logo in black on top of it. And this Batman backpack is 18 x 12 x 5.25 inches making it nice and big and perfect for back to school and the office. The backpack is yellow on the inside with lots of space to store you stuff including you computer as there is a build in laptop sleeve in the backpack. If you like lunch and Harley Quinn then you should check out this classic comic Harley Quinn lunch box. 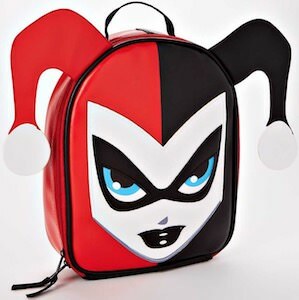 The Harley Quinn lunch box is like a little bag that looks like the comic head of Harley Quinn complete with handle on top and inside the lunch box is just silver in color and ready to hold your food. The lunch bag is 11 x 9.5 x 3 inches and is great fun to own and great for taking your food to work or school. Now you just need snacks and food that Harley Quinn likes to store in your new lunch box. 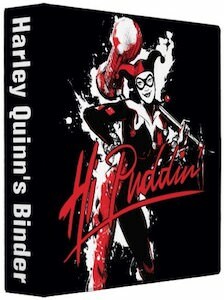 If you want a cool binder for school, work, or home then you have to check out this Harley Quinn hi puddin binder. The binder is black and on the front and back you can find Harley Quinn with her big hammer and on top of it in red the text “Hi Puddin” and to make this binder just perfect for you the text on the spine is personalized for you. The example says “Harley Quinn’s Binder” but it can have your name or maybe something else like “My Batman collection” but that is all up to you and the printing on the side does not cost anything extra. The Harley Quinn binder is made by Avery and comes in 3 different sizes so that you really get the perfect binder for your needs. We can all use a good binder and if you like Batman then you just need this Gotham and Batman binder. It is a binder made by Avery but one you won’t likely find in a store making this really cool. 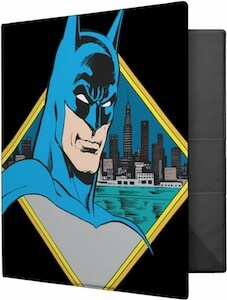 The binder is black and on the front and back you can find a big image of Batman from the shoulder up and behind him, you can find the skyline of Gotham city. And you can get this Batman binder in 3 different sizes and you can choose from a black or a white inside color. Organize your school and work papers in this Gotham city binder. If you like LEGO Batman and need a cool water bottle then this is the LEGO Batman water bottle you need. This is a black water bottle with a yellow silicon strap and a lid that looks like a LEGO brick and even says “LEGO” on it. 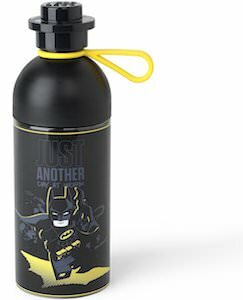 And on the bottle itself it shows Batman running and under his feet, you can see the yellow Batman logo and the bottle says “Just Another Day At Work”. And kids will love this Batman water bottle as it is LEGO and Batman and parents will like it too as it is dishwasher safe so easy to clean after a rough day at school. 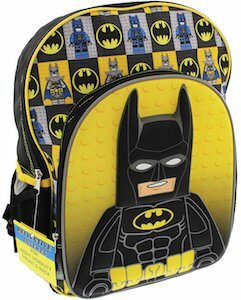 If LEGO Batman is you favorite and you need a new backpack then you just have to get this LEGO Batman backpack. The backpack is 16 x 12 x 4.5 inches making it perfect for school or work backpack but you can take it on many adventures. And the Batman backpack has reflective details so that even in the dark people will be able to see you. The LEGO Batman backpack has two compartments and meshes side pockets so that there is plenty of space to organize your stuff and you can have your water bottle outside in the side pocket. On the backpack, you will find many images of LEGO Batman and even the padded adjustable straps have Batman on them. If you are a Batman fan in need of a backpack then this Batman comic style backpack is something for you to look at. This backpack is great for both kids and adults and has black adjustable straps. 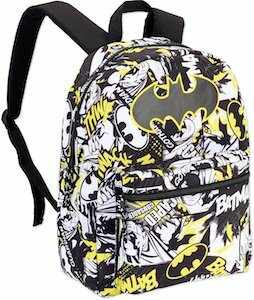 The Batman backpack is black and white and has many yellow details on it too. On the bag you can see many comic details and as expected the Batman logo. At 16.25 x 12.5 x 4 inches this backpack is just perfect for school, work, and other adventures. If you are looking for a back to school backpack or a bag to go to Comic Con then this Batman backpack is what you need. If you like Harley Quinn special like she was in the Suicide Squad movie then this notebook would be a great addition to your school or office supplies. This spiral notebook shows a picture of a smiling Harley Quinn on the front and her face is covered in tattoos. Inside the notebook, you find 80 white lined pages which makes it great for a big writing job and you could use it as a journal as that gives you plenty of room for the story of your life. 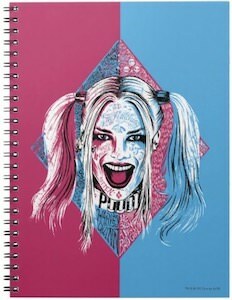 So replace plain and boring with fun and strange all thanks to this Harley Quinn notebook.